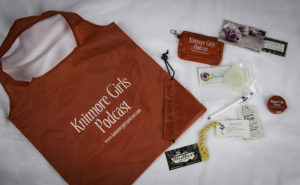 I don’t have as much time for podcasts as I used to, but I love the Knitmore Girls. This mother-daughter duo cover a lot of ground, and it feels like they are speaking to me. I share their sensibility on most issues, and the adventures of the next generation of their family are fun to follow. Although we have only met in person briefly, at Stitches West, I feel a kinship and a friendship between us. This year at Stitches West, I spotted Jasmine and Genevieve as I was racing to teach a class, and I couldn’t do more than say “Hi”. But Jasmine handed me a gift bag as I rushed by. Back in my room later that day, I enjoyed the thoughtful contents. The bag is going to stay in my car for yarn store forays, and I love the fiber and yarn samples from some of my favorite vendors, Miss Babs and Lisa Souza. I never have too many tape measures and stitch marker bags, and I will think of the Knitmore girls whenever I see the bright red in my knitting bag.